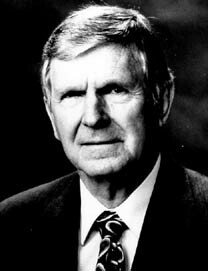 Ralph Anderson called himself an engineer and a farmer. Born and raised in Harrodsburg, Kentucky, he began his formal education in engineering at the University of Cincinnati after serving approximately two and one-half years as a B-29 flight engineer in the U.S. Air Force. He received his Bachelor of Science degree in mechanical engineering from UK in 1950, working during his two years at UK in the Engineering Machine Shop. He spent the next seven years at General Motors and General Electric Company as a test engineer, and at Kett Corporation in analytical analysis and design. In October of 1958, Mr. Anderson founded Belcan Corporation, the headquarters of which are located in Cincinnati. In the early 1960s, Belcan obtained several major contracts to do the engineering work for all gas turbine engine firms in the country. It has been all “up hill” since then. Belcan meets a variety of technical needs for the industry including testing, development, and execution; architectural and facilities engineering; process engineering and design; equipment development; and more. Belcan is a leader in partnering relationships in such diverse industries as paper making, lighting, pharmaceuticals, and chemical processes, to name just a few. Mr. Anderson was married to the former Ruth M. Tucker of Middletown, Ohio. She died in 2006. They had one daughter and three grandchildren. Mr. Anderson died February 13, 2010.